Hello, GSers! I spent yesterday prerunning a big chunk of new gravel and dirt, so Sunday's ride will feature terrain we haven't seen and one pretty good hero section. We will ride through Deal's Gap (yeah, I know. Sorry.) to Robbinsville, then take the newly reopened Tatham Gap Rd to Andrews. We'll stop for gas/toilet break, then take Beaver Creek to the Super Secret Road that isn't in Google Maps or Garmin BaseCamp. We'll take that road west across Porterfield Gap towards Little Snowbird. We'll take Little Snowbird northeast towards Joyce Kilmer. We then will have a decision: if the weather cooperates and it's still fairly early in the day, we can take the Gravelhala over to Tellico Plains, then north on 360 and 411 back to town. If we are running late or whatever, we can pop back on 129 and come home through Deal's Gap. Riders should carry a supply of water and some snacks; there isn't much after we leave Andrews. The road kinda turns to crap at Porterfield Gap. It's rutted, bumpy and gravelled with stones the size of hen's eggs. 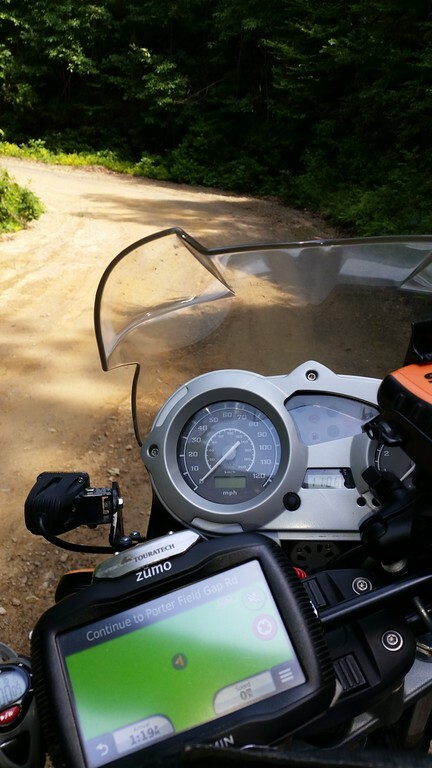 This section of road is absolutely passable on big bikes, but it is MUCH MORE CHALLENGING that my typical dualsport routes. Unfortunately, there is not a bypass for the hero section, so this ride should not be anybody's first day in the dirt. (US129 & Louisville Rd, across from Wal-Mart). 9am - I want kickstands up, gassed & ready to go.